The piece was simple. 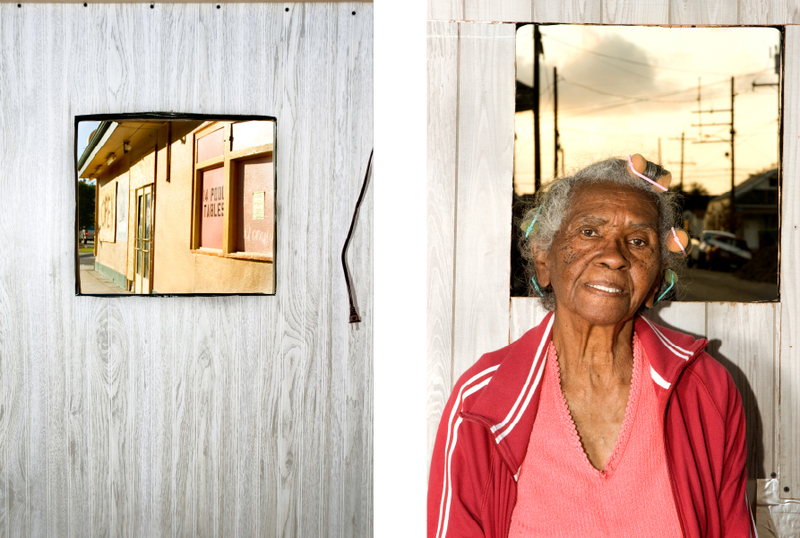 A photo booth was constructed from post Katrina debris and placed in the street of various neighborhoods of New Orleans, L.A.; passing neighbors were invited to sit and have their portraits taken. In place of the usual backdrop, I cut a rectangular opening in the booth’s back wall. Through this gesture, the neighborhood itself, the light and sky quality of the moment, were documented along with the subject. Contemplation on such philosophical musings as “Us and Other” or “The Moment” arise. Essentially, each neighbor was celebrated through the act of portraiture. We shared what proved cathartic: the experience of dissolving barriers. Two prints were developed for each portrait, one for photographer and one for subject. Neighbors had the pleasure of being featured, and the paradigm now stripped of its squareness and redefined, had the pleasure of being destroyed.